I spent part of today setting up things in my little studio to shoot, starting of with some Christmas things. Yes, I know ... its either very late for Christmas items, or way too early, but these are things I'm planning to either pass on to others in need, or sell off. 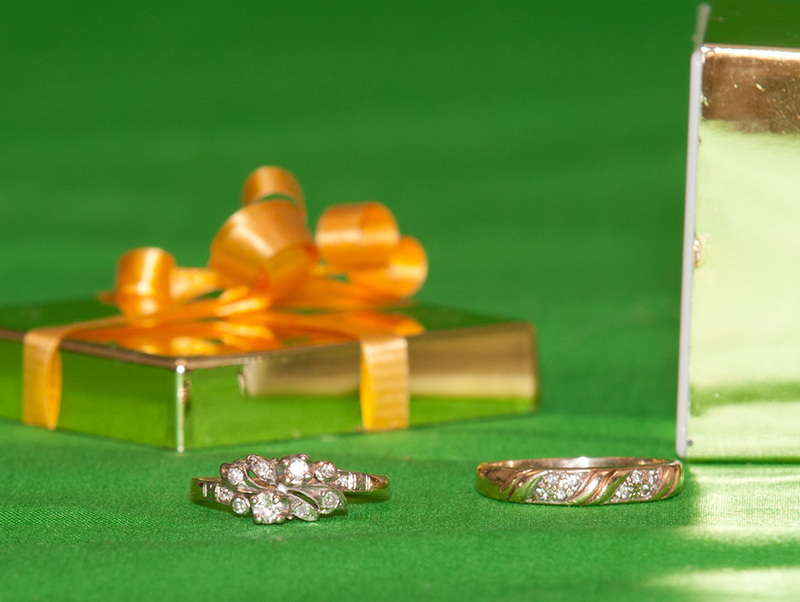 This past few years we've managed to inherit some things from my mom, and then from my aunt and we have some things from my husband's family, and we had 35 years worth of our own Christmas belongings ... something had to give. 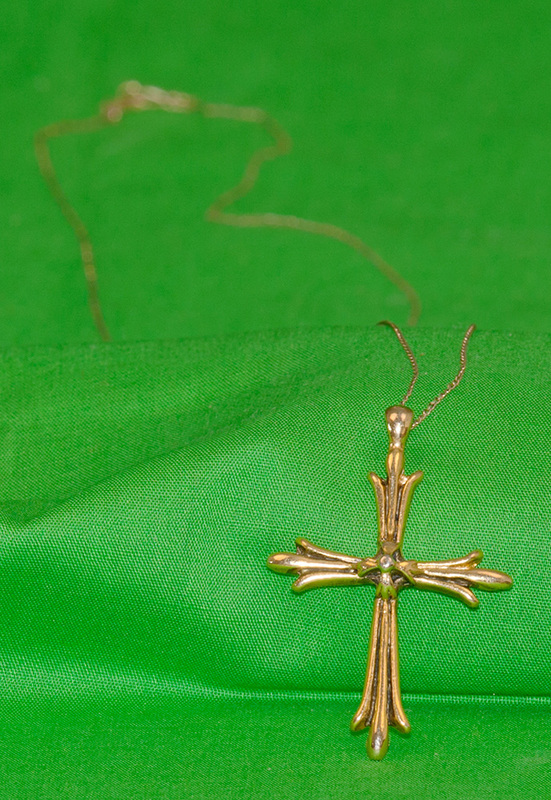 So, some of the first things I set up and shot photos of were those Christmas items cluttering up the studio. Now I can box them up and send them off. 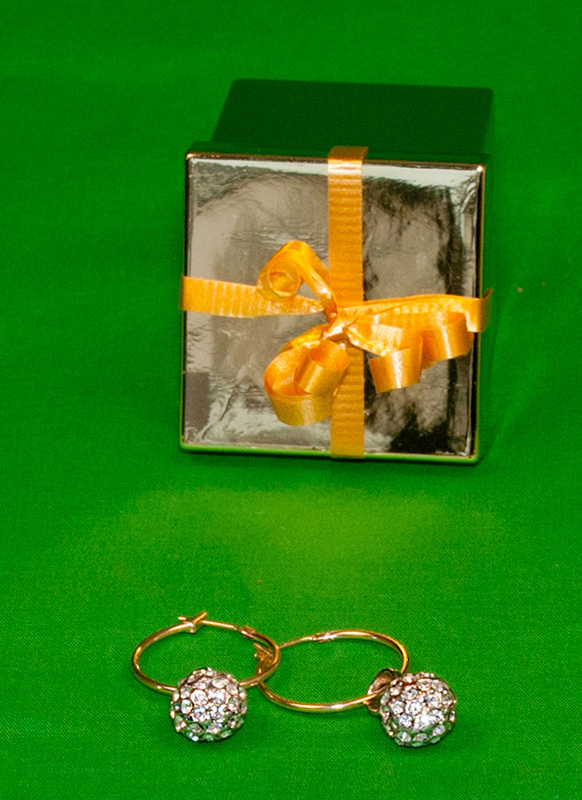 Oh - not to worry, today I'm not posting those Christmas things, but some of the jewelry items I shot afterwards. 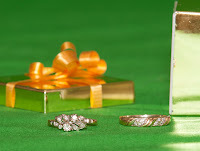 Some of the jewelry belongs to my aunt. Since she's in a nursing home, keeping it in her room isn't an option, because ... well, there are some residents who get a little too handy with belongings they don't own. Since we're the closest family (her son lives out of town), we keep her good stuff in boxes in the dresser in "her" room in our home. So many of these items are hers ... I've already shot and posted most of my own jewelry in previous posts. 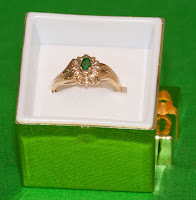 The first set I've got here is actually an engagement ring that belonged to my grandmother. My aunt inherited that, and she's passed it on to me, as the oldest granddaughter. 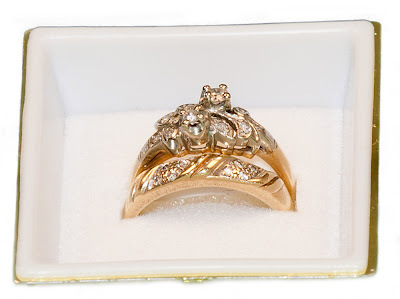 It's a lovely ring with leaves and diamonds on the shoulders and although it isn't exactly designed with flowers, it somehow gives one the impression of flowers. My grandmother was married in the early 1920s in Scotland, and they migrated to Canada before my mother was born. 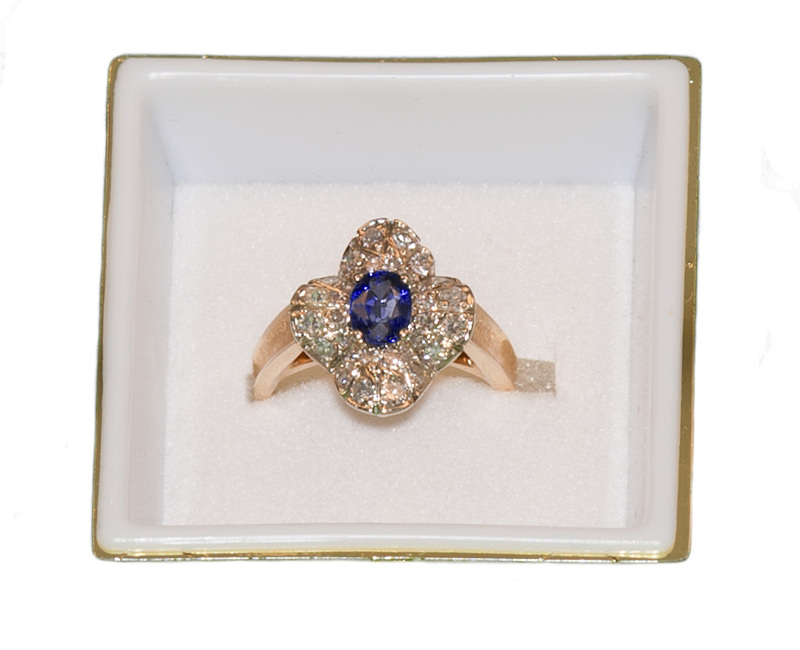 From all accounts, they came here in 1925, and the ring was on her finger at that time. 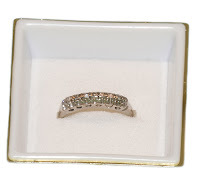 I love this ring, and I've taken to wearing it instead of my own rings (my rings were stolen years ago, twice, and the ones I own now are a second replacement set) - quite likely because I feel like I have more of a connection to this ring, than to my own. 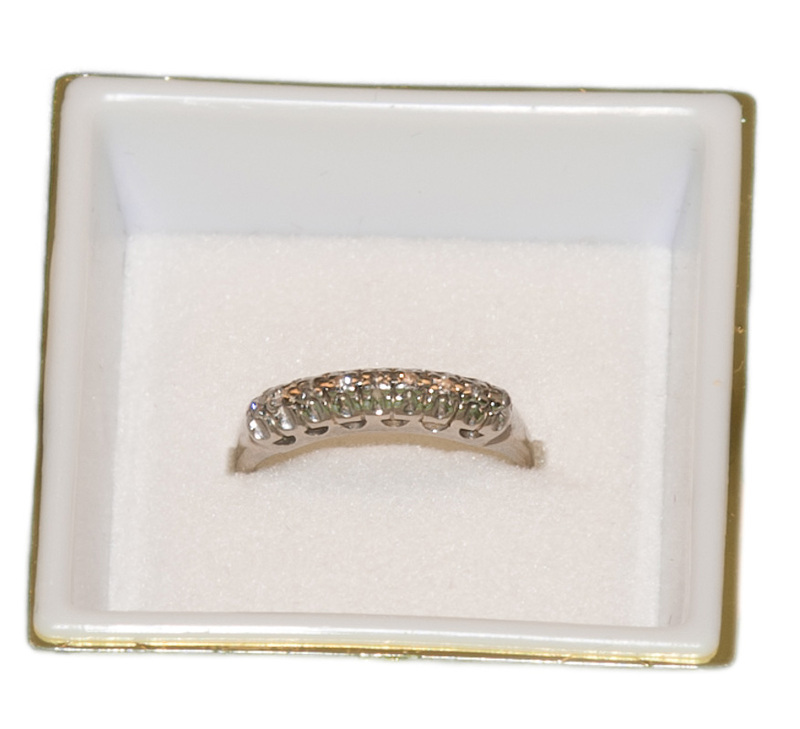 The next ring is a platinum band set with a double row of small diamonds. It reminds me a lot of my mother's wedding band in fact, although this particular one is my aunt's, and it comes from the early 1950s, and was custom made, as was my mother's. My aunt has tiny fingers, and her rings don't go past my knuckle. I don't have big hands (I wear a 6-6.5 ring), but her rings make my fingers feel gargantuan. 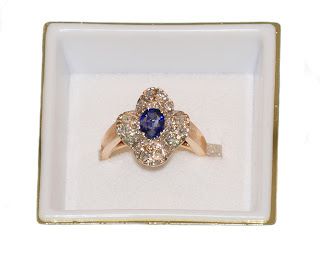 This stunning sapphire and diamond ring with a distinct wave-shape also belongs to my aunt. 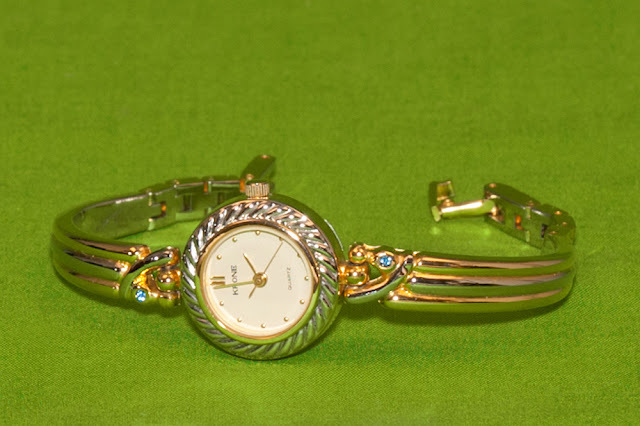 This one is much more recent (perhaps the 1980s or early 1990s), and I don't believe I've seen her wear it more than once or twice in these past 20 years. I'm not sure why, because it's elegant and flashy, and eminently suitable for the sort of gatherings she used to attend. 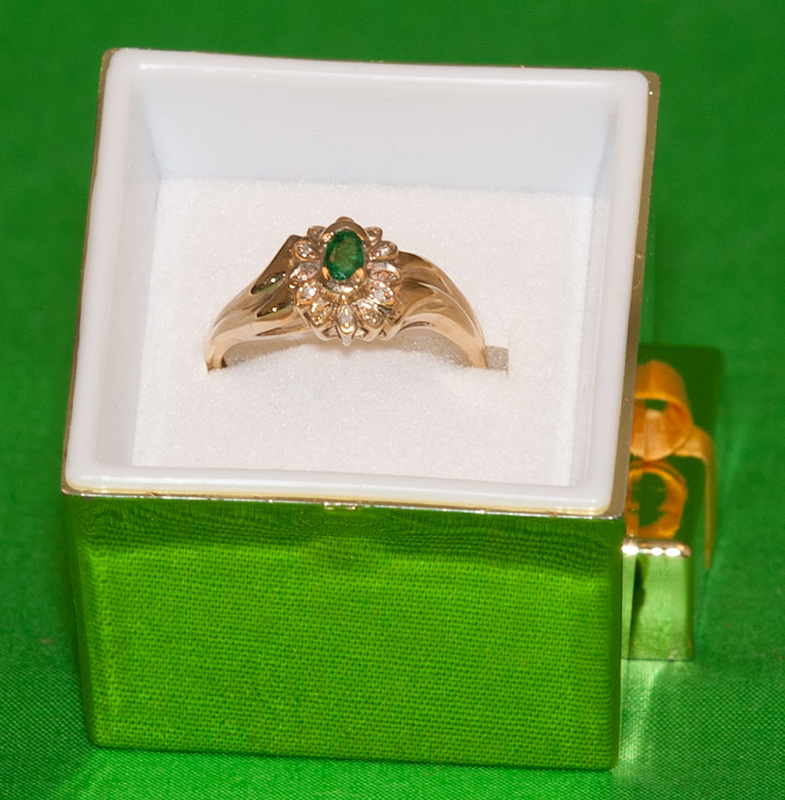 Also one of her rings is this ring with an oval emerald surrounded by small diamonds. This was a gift from her son and daughter-in-law, and although it is a pretty ring, the setting is quite large on her tiny fingers, and looks awkward. It's design is much more suited to a larger hand with longer fingers, and she has not (to my knowledge) ever worn this ring. The ring she has worn most (besides her wedding ring) is this small black onyx in the shape of a heart, with a tiny diamond at the top. 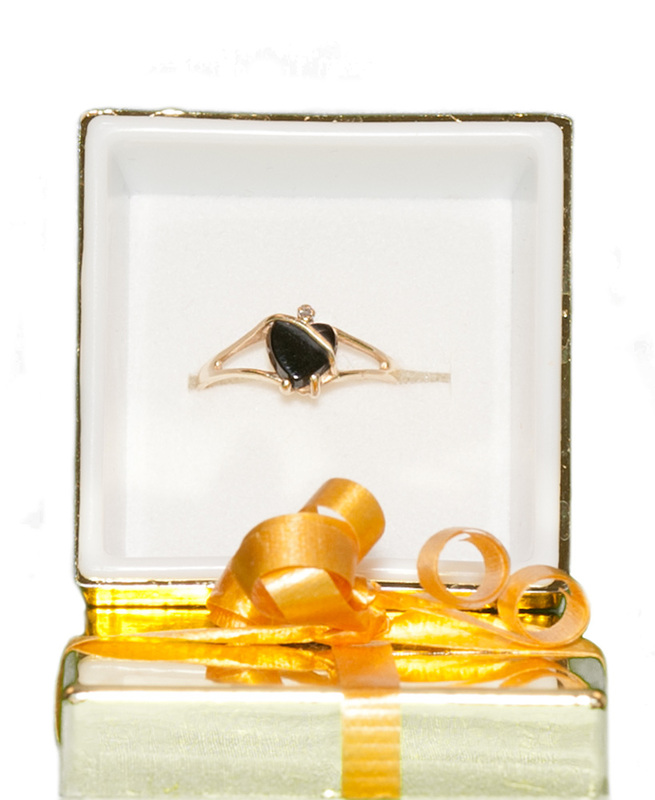 The fine wire-like strands of gold wrapping the heart are delicate and the ring looks perfect on her tiny hands. 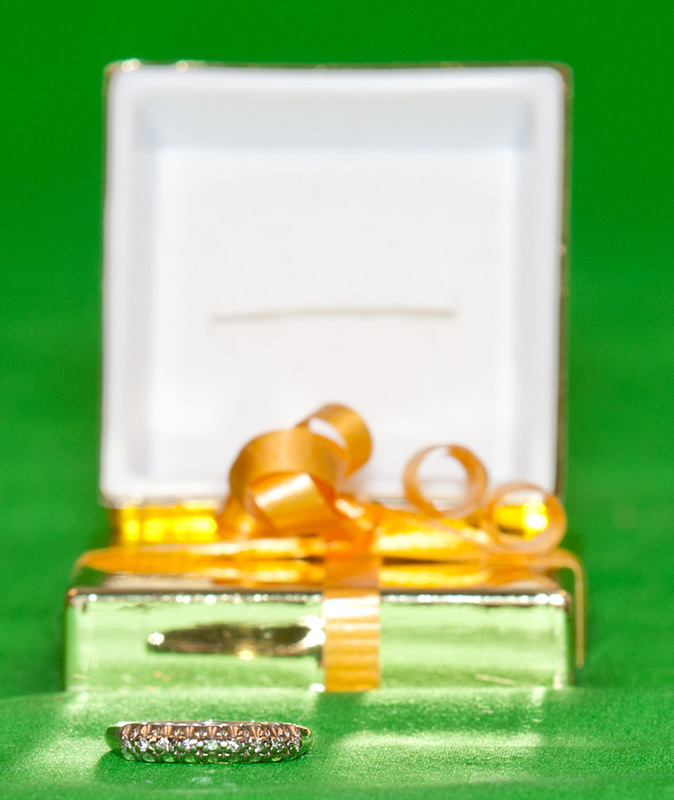 This wasn't an expensive ring, but one she wore almost every day. 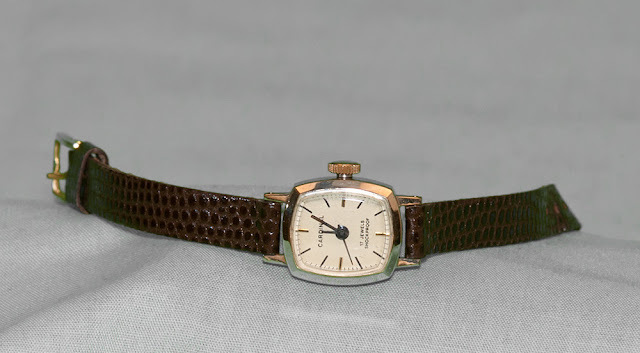 The balance of things are a variety of watches - a ladies round-faced, gold and silver banded watch with tiny blue stones; a square-faced ladies watch with leather band; a man's work-wear watch (this is one that belonged to my uncle who wore it to work almost every day.) The crystal is scratched and worn, but it still works. As well, there is a ladies pendant watch from the 1960s, a gold cross and chain, and a pair of pink-plastic beaded/pearled hair combs. Oh, and of course, a pair of amber and rhinestone drop-earrings with screw-backs and an amber stone choker necklace, both from the late 1960s, and both belonged to my aunt. Gold and diamond hoop earrings. 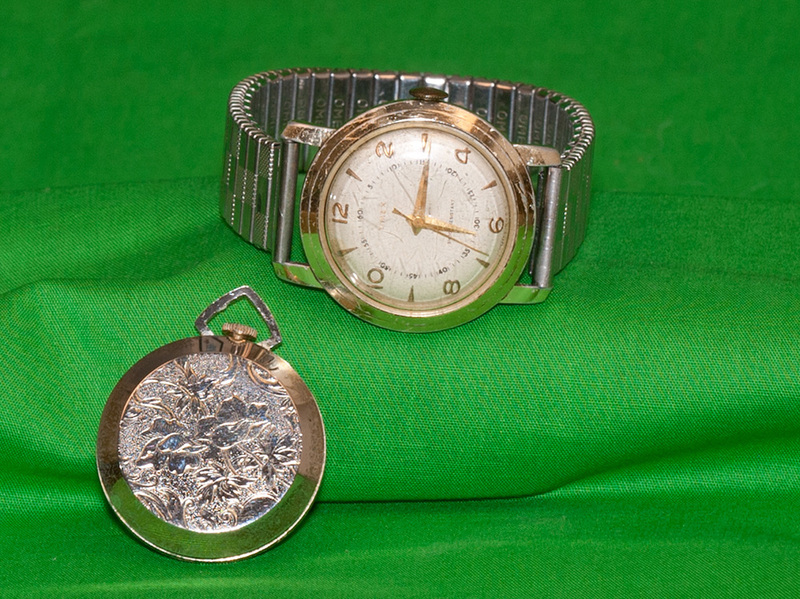 Ladies pendant watch, 1960s. 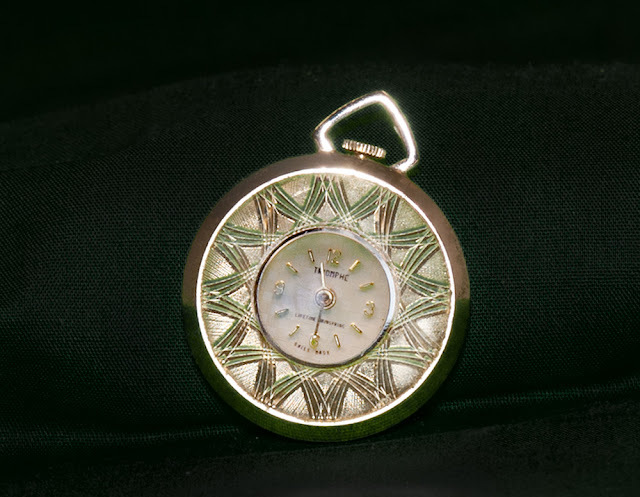 See "man's watch" below for a shot of the back of this pendant. 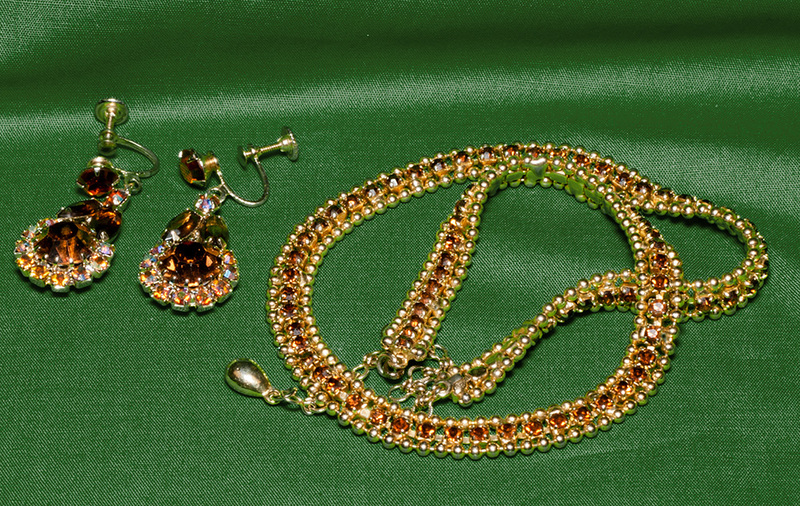 Elegant amber & rhinestone drop earrings, and amber and gold choker. Mans Every-day Watch. Below it is the engraved back of the 1960s pendant watch from above. 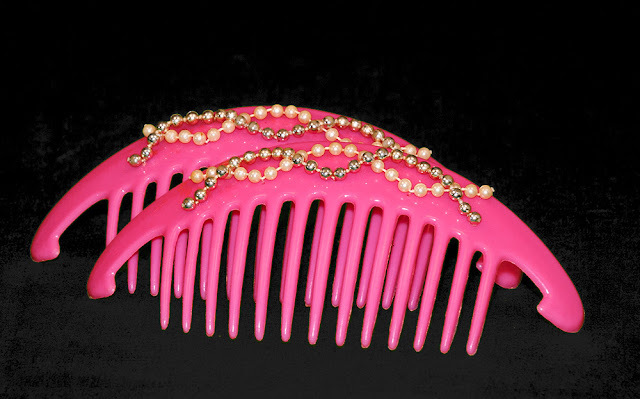 Large beaded hair combs of bright pink plastic. I guess that's about it for this time around. Some gems, and some not so gem-like.